Imagine that your beloved Greyhound is quietly working on a chew toy and starts choking. Something has obstructed his airway and immediate intervention is critical. He is now unconscious. Would you know how to manage this medical emergency? 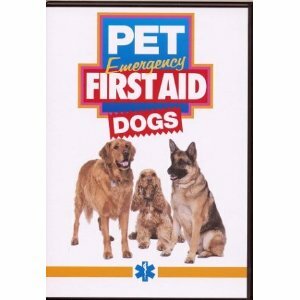 The video Pet Emergency First Aid: Dogs could potentially be an important investment in your dog’s well being as it will instruct you in how to deal with many canine medical crises, perform life saving techniques and will familiarize you with how to do basic assessments. This well-produced, extremely comprehensive 41-minute video endorsed by the ASPCA (American Society for the Prevention of Cruelty to Animals) demonstrates treatment on live dogs and life-like dog models leaving little to the imagination. Although books on pet first aid are available, observing actual demonstrations is an optimal way to learn techniques. Watching this video several times and reviewing it annually will help assure that in a time of crisis and stress your visual and auditory memory will be ingrained with some basic emergency medical skills allowing you to give timely and appropriate care to your dog. The video outlines what we should have in a pet first aid kit and discusses what is normal canine body temperature, pulse, respiration and hydration plus how to assess each. You will learn rescue breathing, CPR and management of airway obstruction. Prior to transporting an injured dog to the veterinarian you will learn what to do when initially faced with various types of wounds; how to start management of a dog with hypothermia or heat stroke; and methods of moving a dog with suspected spinal injuries. Throughout, the video encourages safety and using a makeshift muzzle to avoid getting bitten while assisting an injured dog. It discusses poisoning by various agents and the use of the ASPCA National Poison Control Center phone service.